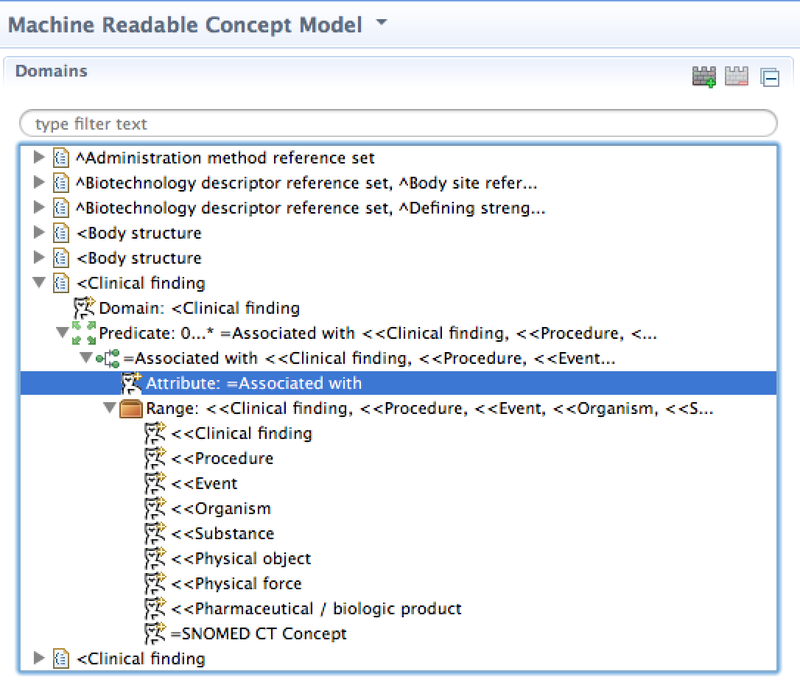 The Machine Readable Concept Model (MRCM) editor allows viewing and maintaining the concept model. To open the editor, click the concept model button in the main toolbar. The nodes on the left side of the editor display the constraints. Details of a selected node can be reviewed or edited on the right side. The example in the screenshot below shows a constraint for concepts in the hierarchy of Clinical findings. All Clinical findings have the attribute Associated with. The range for the values of this relationship are specified below (e.g. Clinical findings, procedures). 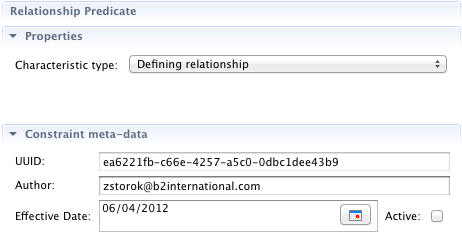 When opening a Clinical finding, an Associated with relationship will be displayed as a property type. When defining the property value, the quick assist will only display concepts that are within the range defined in the concept model. Please note: The constraint model editor is intended as developer tooling, rather than as an end-user feature. Nevertheless, we have found it valuable to view the imported MRCM constraints to clarify unintended behaviors in the MRCM-based reference set editors, as the IHTSDO Phase I MRCM release contains some known problems. The tree on the left side of the editor displays all the constraints, sorted by their domain. When you expand one of the constraint nodes, you can see a quick overview of the constraint's domain and predicate. Depending on the types of nodes you can drill down even further to explore the whole structure of a constraint's predicates and concept set definitions. Clicking on a node displays its details on the right side of the editor. You can add and delete constraints using the buttons in the top right corner of the section; other nodes can be added and deleted using the right-click menu. Please note that the editor enforces a strict constraint model structure, which means that the commands for adding new nodes might not always be available. If this is the case, just delete the existing node you want to replace before trying to add a new one. Dependant on the type of node you selected, the right part of the editor will change. Every detail page contains a Constraint meta-data section, which shows the common properties of every constraint model node, such as UUID, author, effective date and active/inactive state. 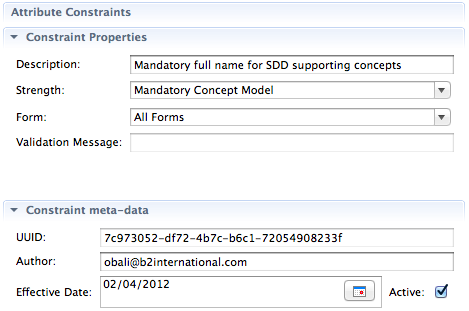 The strength of the MRCM constraint can be specified on at the attribute constraint view. 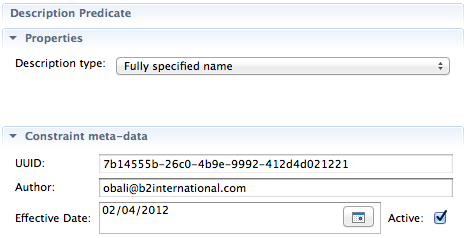 The user can also select which normal form the relationship predicates should apply for. The reference set concept set definition allows concepts to be restricted based on their reference set membership. Reference sets can be used as a domain or a range for a relationship predicate. Hierarchy concept set definition allows specifying constraints to a concept and/or the inclusive or exclusive subtypes. Concept hierarchies can be present as a domain or a range for a relationship predicate. Composite concept set definition allows the combination of more concept sets and concept set definition types, for example adding a list of reference sets as a domain or range. This section allows the user to specify the cardinality of the predicates, and to set relationship group rules for the relationship predicates. Relationship predicate restricts the type of relationships that can be applied to a domain. The relationship predicate should always have an attribute and a range definition. Description predicate allows the user to define the necessary description types a domain should have. Concrete domain predicates allows the user specify the datatypes associated with a domain.